Contact Pierre Cousyn if you are interested in hosting a dressage clinic at your facility. Pierre requires 8 riders/day, plus travel, transportation from/to airport, lodging and meals. Email for rates and availability. Pierre is offering training, lessons and clinics to students. Pierre will travel to your farm if you are local or you can organize a clinic with a min number of students. His teaching style unites the modern dressage with the classical principles. In addition to teaching dressage students, Pierre takes great pride in working with hunters, jumpers, and event riders to improve their horses flat work. ​Organize a clinic at your facility and experience classical dressage. Pierre travels the world giving clinics and welcomes riders of all levels from Training to Grand Prix and also offers his experience in flatwork for Jumpers. Pierre has given clinics in the US and internationally in Germany, Switzerland, France, Portugal, Egypt & Russia, where he was Invited by the Russian Federation. 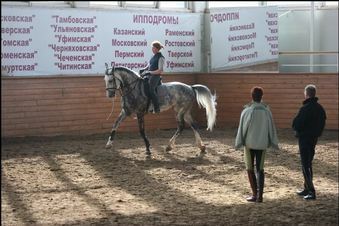 Pierre traveled to Moscow & St Petersburg to give 13 dressage seminars over 2 weeks, with 750 total participants. Followed by two months of training & coaching. Contact info for more info about riding / auditing his dressage clinics. Graduates of the National Equitation School in Samur, France are qualified for instruction of both horse and rider in all disciplines of dressage, jumping, combined training and eventing. As part of his training Pierre has competed himself as an eventer. He has worked with jumpers in France, Switzerland, Egypt, California and New York. Because Pierre’s primary focus is dressage, he has made a significant impact with jumpers and event riders by improving their flat work to create a more balanced and well rounded athlete.